Dry eye disease is a chronic condition characterized by either a decrease of tear production or an increase of tear evaporation. Dry eye disease affects about 40 million Americans and 35% of all eye patients have dry eye syndrome. About 75% of people over the age of 65 have the syndrome as well. About nine in every ten dry eye conditions are related to a person’s surrounding environment. Many of the root causes of evaporative dry eye stem from patients having meibomian gland deficiency caused by not blinking appropriately. How is Dry Eye Treated or Managed? Eye drops are an excellent lubricant and help control inflammation. Another great treatment we have available is BBL ™ (Sciton) therapy to the eyelids. Light therapy has been proven to control inflammation within the skin by targeting superficial blood vessels. It impacts the bacterial flora on the skin and eyelids, as well as increases the skin temperature, all of which have a beneficial effect on the meibomian glands. If there is an inflammatory component to the patient’s eye lids or a rosacea/ocular rosacea present, we use Omega-3 fish oil. Most diets in the U.S. consist of corn-fed beef and processed foods, which are high in Omega-6 fatty acids. These actually promote inflammation and the ratio of Omega-3s to Omega-6s needs to be brought back into balance. We also prescribe RESTASIS ® (Allergan) or Xiidra (Shire) to be used twice daily, especially if there is some inflammation present and/or a decrease in tear production. 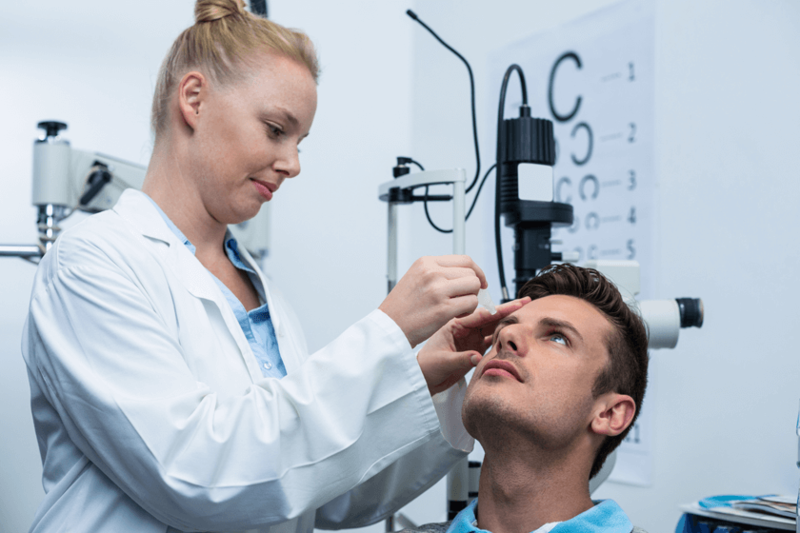 If there is concern that the cause of a patient’s dry eye condition might be stemming from an autoimmune disease like Sjögren’s syndrome, the Sjö Test (Bausch + Lomb) has been an invaluable resource for diagnosis. The Greek word for “aging eye,” presbyopia is the most prevalent eye condition in America, affecting most people after the age of 40 and everyone by their early 50s. Presbyopia causes near vision to fade with age due to a stiffening of the eye’s natural lens, making it difficult to see things up close. This condition requires a dependence on reading glasses for near and intermediate visual functioning especially in low light conditions.